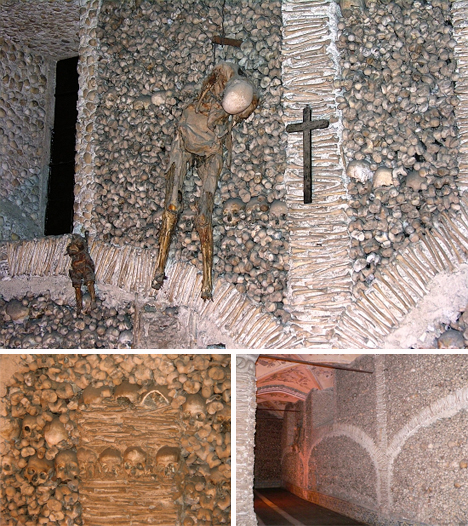 It sounds like a horrible nightmare: human bones stacked in patterns on the floor, their skulls lining the walls and staring, gaping-eyed, at visitors. It’s no nightmare, though: in churches, cathedrals and underground chambers all over the world, the bones of millions of dead greet visitors. 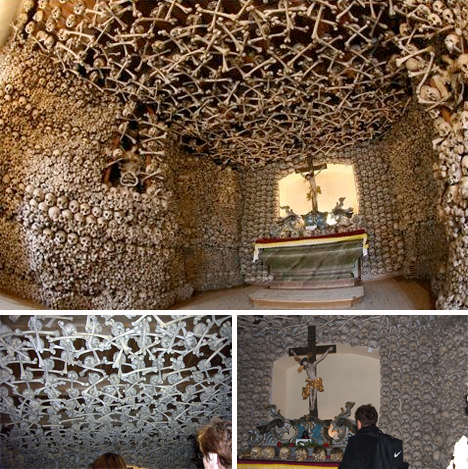 The grisly rooms, known as ossuaries, serve as the final resting place for human remains, often due to overcrowded cemeteries. They exist for different reasons, but they all hold a sort of macabre fascination for us, the living. These seven stunning examples of ossuaries remind us that life is fleeting, but some part of us can live on in this world. 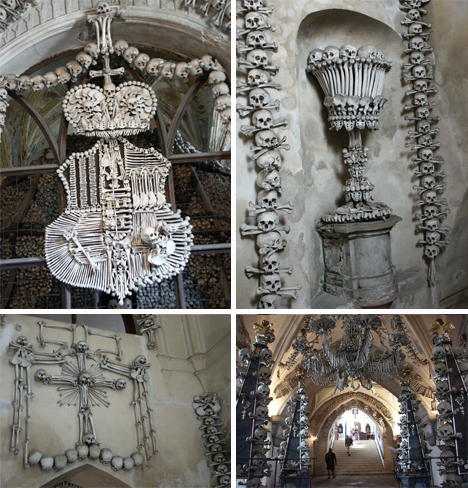 Easily one of the most incredible collections of human bones in the world, the Sedlec Ossuary in the Czech Republic is unlike anything else. The small church rests at the outskirts of Kutna Hora and is filled with the mortal remains of more than 40,000 people. The origins of the “Bone Church,” as it’s commonly known, are nearly as interesting as the array of bones. In 1278, an abbot named Henry made a pilgrimage to Jesus’ burial place and brought back a small amount of earth. He sprinkled the dirt over the Sedlec cemetery, making it holy ground. Suddenly, it was the most popular place to be buried. When the cemetery ran out of room, the previously buried bodies were dug up, starting in 1511, to make room for the more recently dead. It wasn’t until 1870 that the excavated bones were put to use. That’s when a local woodcarver, František Rint, was employed to arrange the huge quantity of bones in an attractive way. Rint proved to be a true artist, creating the most amazing bone art the world has ever seen. 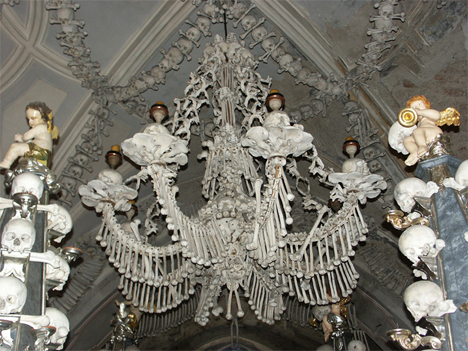 A coat of arms on the wall depicts a raven pecking at a skull, the breathtaking bone chandelier uses every bone in the human body at least once, and the walls and ceiling are adorned with jaunty strings of bones and skulls. The chapel is a Christian church, not a cult or Satanic ritual space as is often rumored. The bones on display were simply removed from the ground to allow more Christians to be buried on holy ground. The resulting ossuary is maybe the most beautiful one on Earth. Santa Maria della Concezione is a wonderful example of the fact that not everyone sees death as something to be feared. The church features the remains of more than 4,000 Capuchin friars arranged in artistic displays. 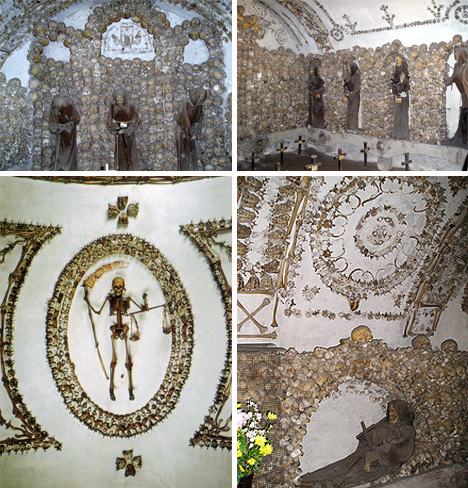 Some bodies are complete and dressed in Capuchin robes, but most have been disassembled and are displayed individually as bones in artful designs. A plaque in the chapel tells visitors in three languages “What you are now, we once were; what we are now, you shall be.” It is a reminder that life is fleeting and that any one of us could be gone tomorrow. Rather than being gruesome or horrific, the reminder is gentle and positive, reminding us to take care of our affairs today and be right with the higher power at all times. The Brno Ossuary has been quietly existing under St. Jacob’s Square for hundreds of years, mostly forgotten. When a new construction project was set to begin in the area in 2001, a routine exploratory archaeological dig was performed. What it turned up was beyond anyone’s imagination. The remains of approximately 50,000 people were found stuffed into the subterranean channel. The bodies were likely dug up from cemeteries to make room for more burials. They were, at one time, stacked neatly, but centuries of neglect and flooding saw them washed into a big messy pile. The city began restorations on the site and plan to open it to the public in 2010 or 2011; it will be Europe’s second-biggest ossuary. And although it’s filled with dead bodies, the ossuary won’t be a place to get lost in morbidity or sadness; rather, it will be an ideal place to meditate on the relationship between life and death. 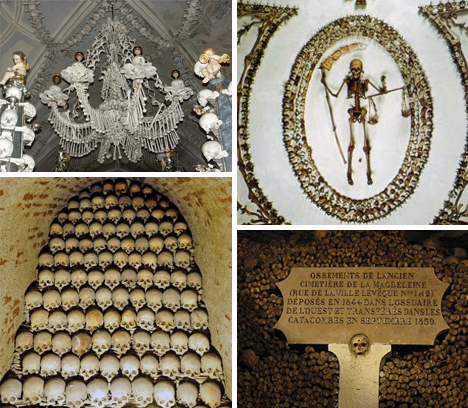 The Capela dos Ossos, or Chapel of Bones, sits next to the Church of St. Francis and is a major tourist attraction in Evora. 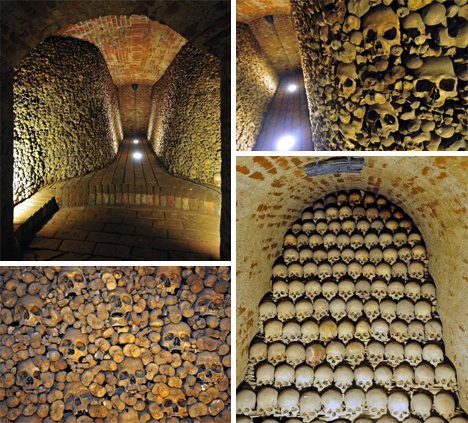 Like the above ossuaries, the goal of this particular mass crypt isn’t to scare or disgust; it’s to inspire visitors to contemplate the transitory nature of life. The Capela dos Ossos was created in the 16th century to handle overflow from local cemeteries and to communicate the inevitability of death. One of the more noticeable features of the chapel is the two dessicated bodies – a man and a young child – hanging by chains from the wall. Their identities are unknown, but local legend says that they are a father and son who treated the mother of the family badly and were cursed. 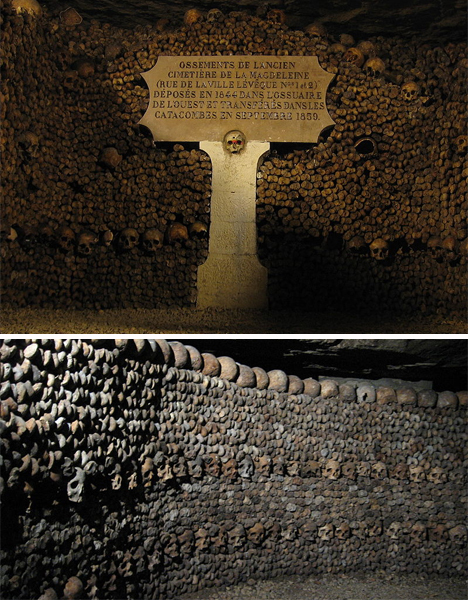 The bone-lined catacombs under Paris are arguably the most famous – and undoubtedly the largest – underground ossuary in the world. From the 18th century, poor burial procedures and hopeless overcrowding in Parisian cemeteries were causing widespread disease among inhabitants. It was decided that the dead would be buried in a the large system of tunnels (actually depleted quarries) beneath the city, and the long process of moving them all began. While the bones were originally just piled up and labeled, French officials eventually realized that the catacombs could become a major tourist attraction. The bones were tidied and arranged in neat displays, with stacks of tibiae and skulls forming lovely – if macabre walls. Sadly, a vandalism incident in September 2009 caused Paris officials to close the catacombs to tourists for an undisclosed period of time. 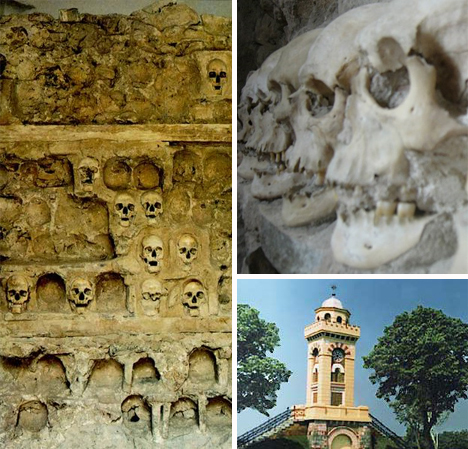 The Skull Tower in Serbia is the only bone collection on this list that is actually meant to inspire terror in those who see it. However, the terror incited by the tower was meant for a long-ago enemy. In 1809, the Serbian rebel army suffered a significant setback in their quest for freedom from the Ottoman Empire. The commander of the Turkish army ordered the heads of the fallen Serbs to be cut off and mounted on a tower to warn anyone who might try to fight against the Empire. A total of 952 were once a part of the Skull Tower, but over the years deterioration and family members have claimed most of the skulls. Only 58 remain today, and a chapel was built to protect the tower. It stands today as a monument to the brave Serbs who fought for their independence.